A Canadian government website claims Santa Claus signed an international agreement to relocate his workshop to the South Pole to escape the effects of man-made global warming in the Arctic. Policy Horizons was created to advise government officials on emerging public policy issues. The group put out a series of Christmas-themed blog posts that tie into emerging liberal policy concerns. Horizons also put out blog posts on Santa relying on a self-flying sleigh, investing in Bitcoin and even using 3D printing technology to make toys. The latest blog post, however, is meant to focus on climate refugees. 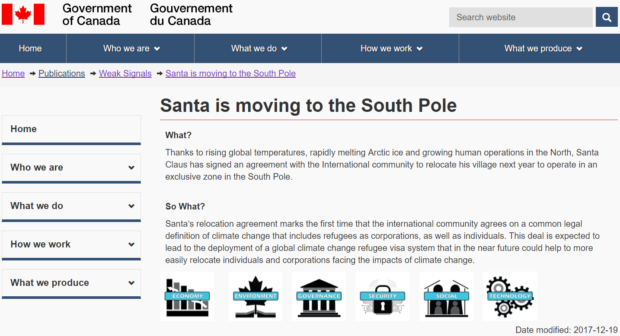 “Santa’s relocation agreement marks the first time that the international community agrees on a common legal definition of climate change that includes refugees as corporations, as well as individuals,” reads the Horizons website. “This deal is expected to lead to the deployment of a global climate change refugee visa system that in the near future could help to more easily relocate individuals and corporations facing the impacts of climate change,” the website continues. Politicians and environmentalists have been claiming for years that man-made global warming will increase the number of peoples displaced by extreme weather events and violent conflicts. A recent study even claimed temperature changes drove increased applications for asylum in Europe. A June study predicted 2 billion “climate change refugees” by the end of the century if nothing is done to reduce greenhouse gas emissions. Most famously, the United Nations Environment Program predicted there would be 50 million “climate refugees” by 2010. When that didn’t come to pass, the UN quietly removed a web page containing the information, and pushed the prediction to 2020. What a joke. Is this for real? If it is for real, the Canadians have a problem. A child should not be leading this country.